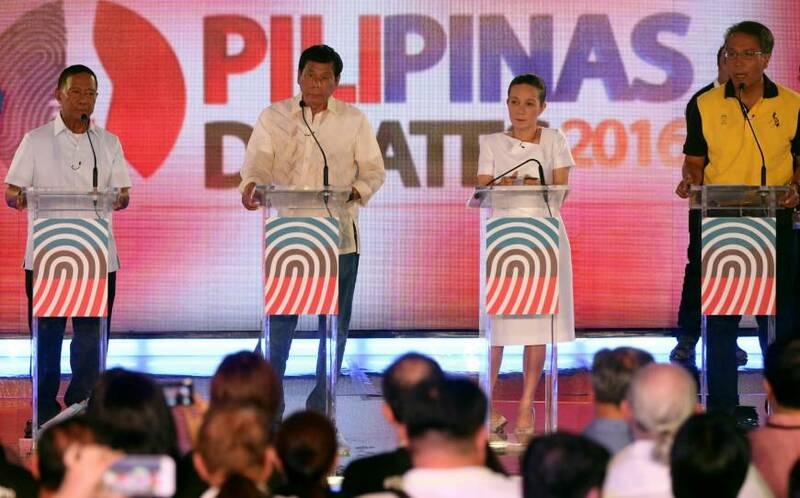 MANILA - A Philippine presidential debate erupted into heated exchanges Sunday over allegations of corruption, a lack of patriotism and incompetence hurled against the leading candidates in a tight race to lead their poor and divided nation. The second of three debates, held in the central Philippines’ vote-rich Cebu province, aimed to shift the public’s focus toward policy debate and programs to confront social ills. The four main contenders in the May 9 elections, however, often used the nationally televised debate to exchange personal attacks. President Benigno Aquino III ends his six-year term in June. Under Aquino, the economy has been growing steadily but daunting challenges remain, including corruption and poverty, issues that figured prominently in Sunday’s three-hour debate. 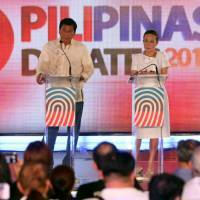 Among the first to square off were Sen. Grace Poe, who has led in pre-poll surveys, and Vice President Jejomar Binay. Poe sniped at Binay for failing to attend a Senate inquiry into allegations of large-scale corruption against him when he was still mayor of the financial district of Makati in Manila. Binay lashed back by questioning Poe’s love of her country because she once renounced her Filipino citizenship and became a U.S. citizen to live with her family in the United States. “You always say you’re a true Filipino, but how can you be one when you took an oath to become an American and you abjured, you were ashamed of where you came from,” Binay said. Elections officials disqualified Poe from running for president last December, saying she was not a natural-born Filipino as the constitution requires of presidential candidates and did not have the 10-year residency requirement ahead of the elections. Poe brought her case to the Supreme Court, which ruled this month she was eligible to run. Mayor Rodrigo Duterte, from the southern city of Davao, who is known for his tough stance against criminality and corruption, challenged Binay to withdraw from the presidential race with him if the vice president can prove that Duterte has been charged with graft. “I’d like to be very, very brutally frank to the vice president. Sir, you have so many cases … that’s public knowledge,” Duterte said. Duterte accused another candidate, former Interior Secretary Mar Roxas, of a lackluster response to the massive deaths and devastation wrought by Typhoon Haiyan, which ravaged the central Philippines in 2013. Duterte called Roxas “a weak leader,” adding that the former interior secretary appeared “lost, like a zombie” amid the typhoon devastation. Roxas said Duterte, if elected, will be a dangerous leader because he has a tendency to spring into action based solely on his own suspicions, alluding to Duterte’s repeated threats to have criminals and drug pushers killed across the country if he wins the presidency. The final debate will be held next month.